Over the last ten years there has been a well-documented increase in the energy density of electronic devices. As this­­ energy density has gone up, so has the heat dissipation on electronics packages. In response to this challenge, significant research has taken place to develop chip level cooling systems to meet heat fluxes in excess of 1000W/cm2. 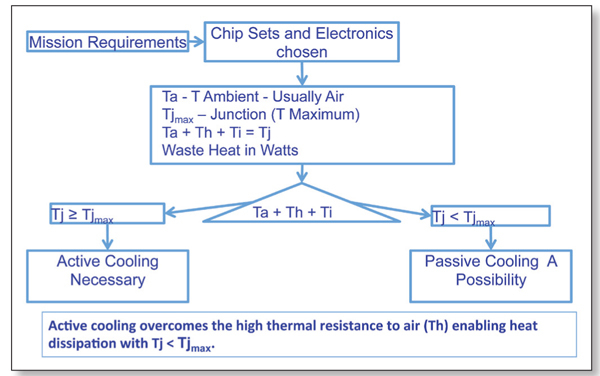 As stated by Phelan et al.1, “Calculations indicate that the only possible approach to meeting this heat flux condition, while maintaining the chip temperature below 65°C, is to utilize refrigeration.” While research has focused on achieving heat transfer rates at the chip level, the resistance to heat transfer to ambient air is often more critical.2 In fact, the heat transfer resistance to ambient air as the final heat sink is the dominating factor in system performance. Certain classes of components such as field programmable gate arrays, diode lasers and mobile network systems are being deployed in environments where passive cooling systems cannot maintain junction temperatures below required upper limits. Programs such as the US Army’s Warfare Information Network–Tactical (WIN-T) fall into this category.3These factors place additional constraints on designers to meet the thermal management challenges of their electronics systems. Passive cooling will be defined herein as a cooling approach that cannot achieve an electronic system operating temperature at or below ambient temperature. In contrast, active cooling systems use added energy to drive the electronic system temperature below that achieved by passive means. Figure 1. Passive and active electronics cooling. In passively cooled systems, the electronics temperature will rise until the enclosure interface with the ultimate heat sink, usually ambient air, warms up enough to dissipate the heat to the environment as shown in the left half of Figure 1. Methods to reduce the internal temperature rise in these systems include liquid coolant loops, pumped phase change systems, high conductivity chassis and heat pipes. Although these methods reduce the resistance to internal heat transfer, they do not help overcome the thermal resistance associated with the transport of heat to the ambient air. Fan cooling aides in heat transfer to air by increasing convection, but this approach cannot lower the enclosure surface below the ambient air temperature. As a result, passively cooled electronics used in high temperature ambient environments run at high temperature, sometimes above recommended operational limits. 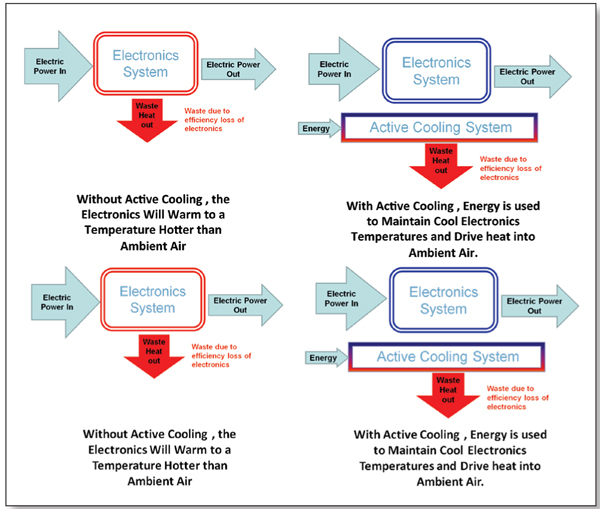 Active cooling uses energy to lower the electronics temperature to acceptable levels as illustrated in the right half of Figure 1. Active cooling systems raise the temperature of the surfaces exposed to air, increasing heat transfer to the air, while simultaneously lowering the temperature of the surfaces exposed to the electronics, thereby increasing heat transfer on both sides of the system. The major advantage of active cooling is that desired chip junction temperatures can be maintained independently of the ambient air temperature. The disadvantage is that additional power is required to accomplish this task. Therefore, the packaging engineer should use passive cooling techniques only in ambient conditions suitable for passive cooling and use active techniques under all other ambient conditions. The maximum allowable junction temperature (Tjmax) is provided by the manufacturer. To determine the junction temperature in the system (Tj), the sum of the ambient air temperature, the temperature rise from air to the package and the conductive temperature rise internal to the package are calculated. If Tj ≥ Tjmax, then an active cooling system is required. If Tj ≤ Tjmax, then a passive system is sufficient. The decision path to determine the need for active cooling is shown in the flow chart in Figure 2. Figure 2. Active-passive cooling decision flow path. The least costly and most efficient time to address such thermal management issues is during the concept development phase of the program. Applying these decision process steps early in the effort can clarify and simplify discussions with program managers and customers, enabling effective thermal management solutions to receive the attention required. Vapor compression systems take advantage of the latent heat of vaporization of liquids that have a boiling point lower than the desired temperature to be managed. The four major elements of the system are the compressor, condenser, expansion valve, and evaporator, as shown in Figure 3a. In the evaporator, the refrigerant vaporizes at a low temperature, absorbing heat from the electronics. At the evaporator, the refrigerant is a low temperature vapor, as shown in the upper left quadrant of the vapor cycle diagram. The vapor then passes through the compressor, where it is brought to high pressure and a temperature typically 10°C to 15°C higher than ambient. This hot vapor is converted to liquid in the condensing heat exchanger where heat is rejected to ambient air. The hot liquid refrigerant then exits the condenser and passes through an expansion valve, dropping the refrigerant to a low pressure and temperature. The low-temperature, low-pressure liquid refrigerant then enters the evaporator and the cycle begins again. Figure 3. Vapor compression system schematic. Vapor compression environmentally controlled units (ECUs) are routinely customized to meet the specific requirements of an integrated design. Three evaporator options available for vapor compression systems include direct expansion, air cooling, and secondary liquid loop as shown in Figure 3. The direct expansion option is shown with the complete vapor compression schematic in Figure 3a. With no separate fans or pumps on the evaporator side of the system, this approach has the advantage of relatively few components for light weight and simplicity, and is the most efficient of the three options. The disadvantage of this approach is that the cold plates and the condenser need to be in close proximity to one another to be effective. The liquid cooled system shown in Figure 3c uses an evaporator that cools a pumped liquid, typically glycol and water. The coolant is passed to a cold plate to remove heat from the electronics. This approach has the advantage that the refrigeration system can be remotely located from the system to be cooled, and disconnected in the field if desired. The disadvantage of this system is the additional temperature rise at the evaporator, and the line losses that can be expected if the refrigeration unit is a great distance from the thermal load. The air cooling refrigeration system uses a refrigerant to air heat exchanger as shown in the upper right quadrant of Figure 3b. Fans are used to move air through the evaporator and circulate the chilled air across the electronics in the enclosure. This method is used when rack mounted electronics are placed in outdoor environments and need to be protected from the elements and from heat. Figure 4. Miniature compressor is 1/10th the volume and weight of conventional systems. The main barrier to using vapor compression cooling systems at the enclosure level has been the availability of refrigeration compressors small enough for the application. 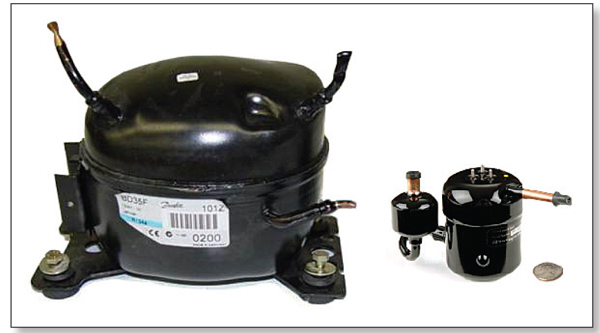 In 2007, a miniature refrigeration compressor came onto the market and is now being used in applications ranging from mobile military electronics to laser cooling on manufacturing floors. This compressor and the first prototype experimental cooling systems utilizing it were introduced in an article6 in the May 2008 issue of Electronics Cooling. The compressor shown in Figure 4 was developed specifically to enable the miniaturization of vapor compression cooling systems for personnel and electronics cooling. This miniature compressor is one-tenth the weight and one-tenth the volume at the same capacity as a competing standard reciprocating compressor. This is the key enabling component in miniature refrigeration systems with cooling requirements up to about 1,000 watts. 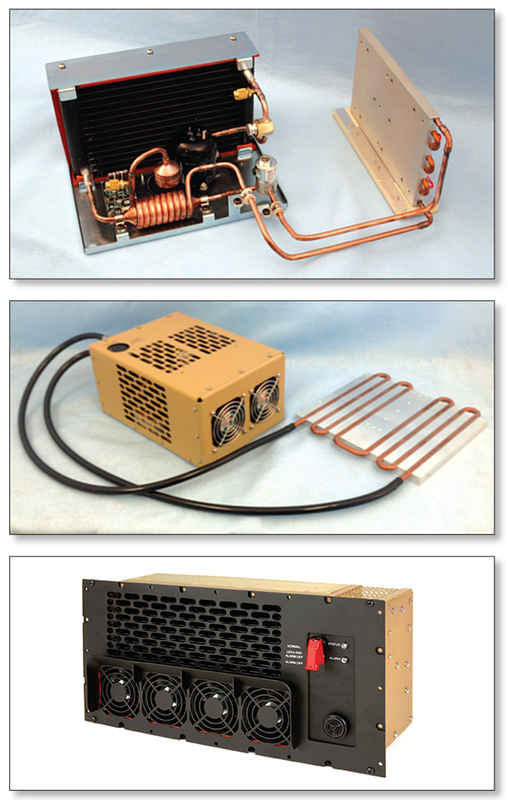 Other enabling miniaturized components include controllers and drive boards that are designed to meet electromagnetic interference (EMI) requirements are shown in the left picture of Figure 5 along with a direct expansion evaporator, shown in the middle picture, and an aluminum condenser and air evaporator with microchannels as shown in the right picture. Figure 5. Components in a miniature refrigeration system. Figure 6. Direct, liquid and air cooling vapor compression systems. 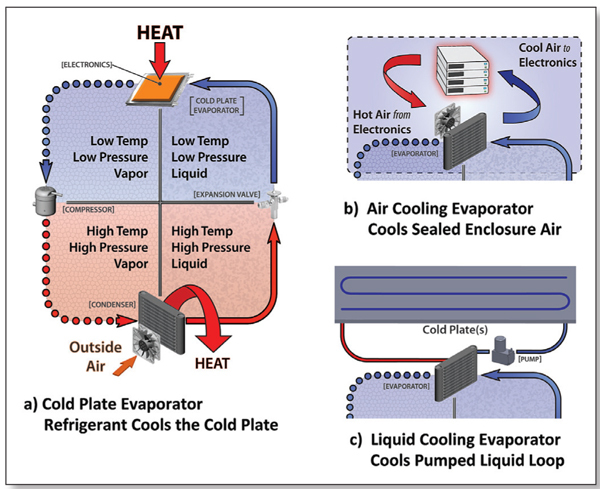 Examples of direct refrigerant, liquid cooling and air cooling vapor compression systems are shown in Figure 6. The direct refrigerant cooling system is for an industrial application. This system uses two-phase evaporative cooling on the cold plate to efficiently remove heat from a pumped diode laser. The liquid cooling system is a military hardened liquid chiller that was designed, developed and is now in initial production for applications with the US Army. It provides 350 watts of cooling to a cold plate via a pumped water glycol solution. The system measures 27.9 cm (11 in) by 21 cm (8.25 in) by 14 cm (5.5 in) and weighs 5.44 kg (12 lbs). The air cooling system shown in Figure 6c is a ruggedized vapor compression cooling/heating system designed specifically to meet military requirements for harsh, high vibration environments. This system has been in service on multiple Department of Defense programs. Most notably, over 1,000 of these systems have been in use on Special Operations Command (SOCOM) Mine Resistant, Ambush Protected (MRAP) vehicles for nearly three years. The air flow patterns for the condenser on the outside surface (left) and evaporator (right) inside the enclosure are shown in Figure 7. The unit maintains a sealed electronics enclosure at or below ambient temperature, enabling Commercial Off-The-Shelf (COTS) electronics to be safely and effectively used in hot, dirty environments. The unit is rated to maintain an internal temperature of 52°C (125°F) in an ambient environment at 52°C (125°F) while dissipating 550 watts of heat. In cold environments, the ECU heats the electronics from as low as -40°C to preheat the system for cold starts. The system weighs 9.1 kg (20 pounds) and measures 47 cm (18.5 in) wide by 22.9 cm (9 in) tall by 17cm (6.7 in) deep. Figure 7. Air flow patterns outside (left) and inside (right) the air cooling environmental control unit. Miniature vapor compression thermal management systems are being custom designed to meet Original Equipment Manufacturer (OEM) and end user specifications for a wide array of electronics thermal management applications. A transit case cooling system has been developed and refined to meet stringent military program requirements for mobile network applications and is currently operating worldwide. A liquid chiller system has been developed for use on radio and computer cooling in mobile environments and several direct refrigerant systems have been developed for end users and OEMs. An airborne cooling system was developed to meet mission critical requirements for cooling infrared cameras. Miniature refrigeration technology is now mature, qualified and fielded for effective application to electronics systems that require active cooling. “Current and Future Miniature Refrigeration Cooling Technologies for High Power Microelectronics.” Patrick E. Phelan, Victor A. Chiriac, and Tien-Yu Tom Lee, Associate Member, IEEE, IEEE TRANSACTIONS ON COMPONENTS AND PACKAGING TECHNOLOGIES, VOL. 25, NO. 3, SEPTEMBER 2002 pp 356-365. “2U Rack Mountable Vapor Compression Cooling System For High Power Electronics.” G. Deming, Electronics Cooling, May 2008.